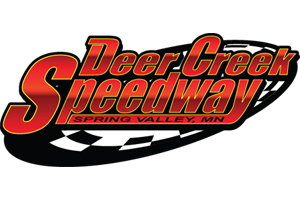 SPRING VALLEY, Minn. (Aug. 7) Photo Credit: Scott Gulbranson Photography – A history-making night turned out to be a record-breaking night Tuesday at Deer Creek Speedway. 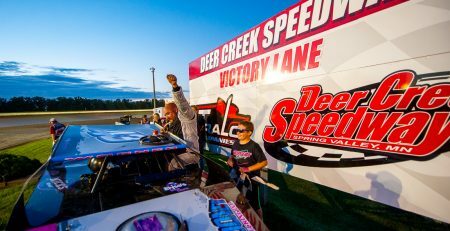 C ayden Carter raced from 17th starting to win the IMCA Modified main event, and $3,000, at the Harris Clash, the first IMCA event held at Spring Valley. Ninth starting Jake McBirnie topped the Karl Chevrolet Northern SportMod feature and earned $1,000. 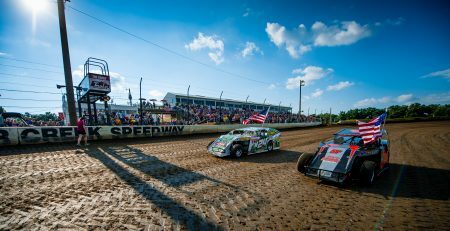 Ninety-six Modifieds and 55 SportMods were entered with the total car count of 151 the highest in the 27-year history of the Clash, which played out before a very full grandstand. Seventeen states and Canada were represented. Carter had moved steadily through the field and into the top three with 10 circuits to go and was in the right spot at the right time when frontrunners Kyle Strickler and Richie Gustin, both two-time Clash winners, got together with four laps left. 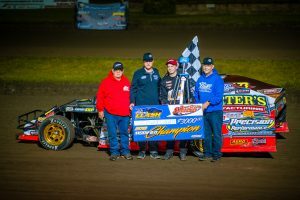 He took charge from that point, winning his career first Clash crown ahead of Troy Cordes, Bran­don Davis, Adam Hensel and Mike Hansen. Cordes had started outside the front row and led past halfway of the 30-lapper, surrendering the front spot following a restart to “B” qualifier and Wehrs Dash at the Clash winner Gustin. Another two-time Clash winner, Kelly Shryock, earned hard charger honors this time around by racing from last in the field of 25 to sixth. 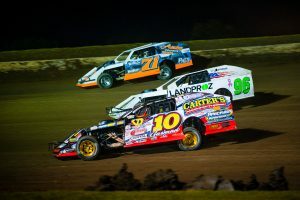 Carter has already won three 2019 Fast Shafts All-Star Invitational ballot qualifying events, the Clash coming on the heels of rich victories at LaSalle Speedway’s Illinois Valley Showdown and Hancock County Speedway’s Hobo 100 special. McBirnie emerged from a late dustup in the Northern SportMod feature after Jared Boumeester led most of the 20-lap contest. Boumeester and Johnathon Logue tangled and Boumeester was sent to the rear of the field and ultimately the pits; McBirnie then motored past Logue following the second of two restarts en route to his career first Clash checkers. Jake McBirnie won the Karl Chevrolet Northern SportMod feature Tuesday during the Harris Clash at Deer Creek Speedway. To his left is runner-up Johnathon Logue and to his right is third-place finisher Joe Docekal. Finishing third through fifth were Joe Docekal, Joey Schaefer and Austin Schrage. Modifieds – 1. Cayden Carter, Oskaloosa, Iowa; 2. Troy Cordes, Dunkerton, Iowa; 3. Brandon Davis, Hayfield; 4. Adam Hensel, Baldwin, Wis.; 5. Mike Hansen, Dickinson, N.D.; 6. Kelly Shryock, Fertile, Iowa; 7. Billy Kendall, Baxter; 8. Joel Rust, Grundy Center, Iowa; 9. Jesse Den­nis, Corning, Iowa; 10. Clint Hatlestad, Glencoe; 11. Justin Kay, Wheatland, Iowa; 12. Chris Abel­son, Sioux City, Iowa; 13. J.D. Auringer, Waterloo, Iowa; 14. Brian Mullen, Seymour, Wis.; 15. Matt Ryan, Davenport, Iowa; 16. Hunter Marriott, Brookfield, Mo. ; 17. Jay Noteboom, Hinton, Iowa; 18. Corey Dripps, Reinbeck, Iowa; 19. Mike Mashl, DePere, Wis.; 20. Richie Gustin, Gil­man, Iowa; 21. Ricky Thornton Jr., Clive, Iowa; 22. Kyle Strickler, Troutman, N.C.; 23. Jacob Hob­scheidt, Plattsmouth, Neb. ; 24. Garett Wilson, Carlisle, Iowa; 25. Kyle Brown, Madrid, Iowa. Northern SportMods – 1. Jake McBirnie, Boone, Iowa; 2. Johnathon Logue, Boone, Iowa; 3. Joe Docekal, Dysart, Iowa; 4. Joey Schaefer, Waterloo, Iowa; 5. Austin Schrage, Cresco, Iowa; 6. Brayton Carter, Oskaloosa, Iowa; 7. Chris VanMil, Barnesville; 8. Austen Becerra, Carthage, Ill.; 9. Nate Chodur, Lake Mills, Iowa; 10. Sam Wieben, Dysart, Iowa; 11. Thomas Nelson, Aurora, Colo.; 12. Alex Schubbe, North Mankato; 13. Josh Appel, Mason City, Iowa; 14. Austin Howes, Memphis, Mo. ; 15. John Albrecht, Glencoe, Minn.; 16. Jared Nytroe, Brandon, S.D. ; 17. Tyler Soppe. Sherrill, Iowa; 18. Jared VanDeest, Holland, Iowa; 19. Nate Whitehurst, Mason City, Iowa; 20. Jake Sachau, Denison, Iowa; 21. Justin Remus, New Ulm; 22. Cole Bents, Rushmore; 23. Kyle Bentley, Fairbank, Iowa. 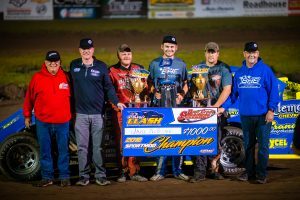 NAPA adds programs and payout to legendary Gopher 50 – Extra $ up for grabs for drivers and fans!